By Mohammed Najeemudheen and Suraj C. B. This article is written with the assumption that you don't want a whole lot of technical information about the PDF format or PDFtoolkit. Instead, we assume that you wish to know just how easily PDFtoolkit can help you work with PDF documents. Still, if you require it, a good introduction to PDF is available in an earlier article titled PDFtoolkit v3.0 and its new PDF Processor. A introduction to PDFtoolkit architecture is another article titled PDFtoolkit At A Glance. To illustrate the capabilities of PDFtoolkit, we created a demo application that performs these simple but necessary functions. In PDFtoolkit VCL, TgtPDFDocument is the class representing a PDF document. To read a document, we call the LoadFromFile() function. The TgtPDFDocument class has a PageCount property that will tell you the number of pages in a PDF document. You can write formatted text with simple HTML style tags to a PDF document using TextOut() method. You can use simple HTML tags such as b (bold), i (italic), s (strikeout), and u (underline). PDF supports Microsoft® PowerPoint®-style page transitions. PDFtoolkit allows you to add transitions to pages using the SetPageTransitionEffect() method. TgtTransitionEffect is an enumeration that defines various transition styles. To see page transitions in action, view the PDF in full screen in Adobe® Reader™. To delete a page, load the document, call the DeletePages() method, and save the document. You can insert pages from an existing document specified by its pathname or by a loaded TgtPDFDocument object. 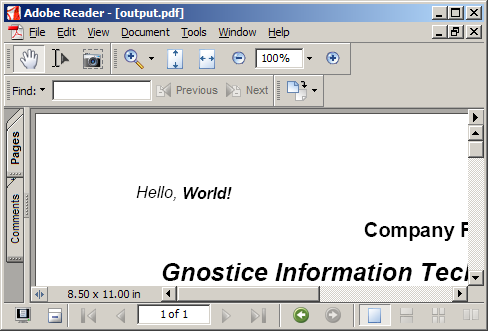 PDFtoolkit can extract pages to a specified pathname or a loaded TgtPDFDocument object. To save a file that has been loaded, call the SaveToFile() method. Next month, we will continue this series with some other everyday PDF-related tasks that can be performed with PDFtoolkit.